The picture below shows you the locations of prefectures in Japan, they are very important to view this site, and of course it is very useful when you study and visit Japan. 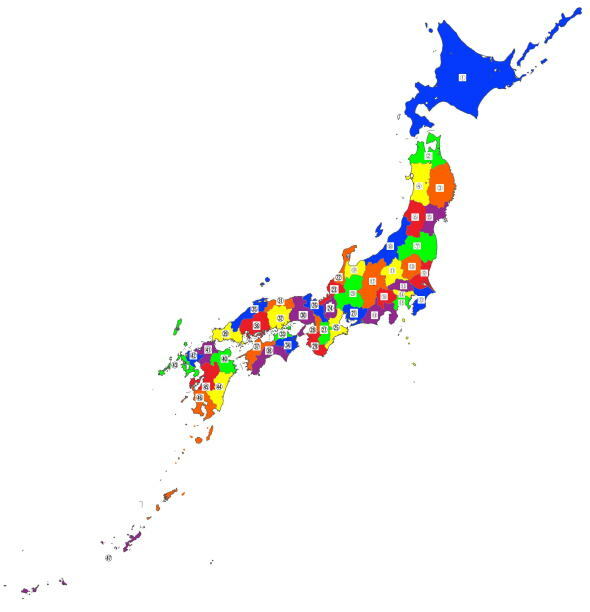 Japan is divided into 47 prefectures, so there are 47 local governments in Japan. And Japanese peaple call them 47 To-Dou-Fu-Ken, it means that they have one To, one Do, two Fus and 43 Kens in Japan. To is Tokyo-To, Do is Hokkai-do, Fus are Kyoto-Fu and Osaka-Fu and other 43 prefectures are Kens. Moreover Japan is divided intow 10 regions; Hokkaido, Tohoku, Kanto, Koshin-Hokuriku, Tokai, Kinki, Chugoku, Shikoku, Kyushu, so the 47 prefectures basically put together neighbours in each region. Please check their locations of each prefectures by the maps below, the each number on map is equal to the numbers before each prefectural names. Please check them up. The prefectural names are arranged in alphabetical order below. Maybe you can find easily.